Some of the most important, game-changing plays in the NFL and college football take place on special teams. Kick returns, punt returns, blocking on punt returns, the audacious fake punt return – these plays are often the difference between winning and losing. A blocked punt is among the rarest plays in the NFL, with only 12 occurring league-wide in 2013. However, opening weekend this year saw three punts blocked, leading many to wonder whether it was just an aberration and a quirk of the sport, or the sign of a trend spawned by any changes in the game. In fact, there were no major offseason rule alterations that would lead to an adjustment in blocked punt strategy. This suggests it was simply an odd early-season cluster of blocks, and that the collective outcomes of punt attempts will likely regress to the mean over the course of the year. A video review of one of these plays readily reveals the culprit as poor punt team execution rather than any new scheme employed by their opponent. On the opening drive of their game against Miami, the Patriots had a quick three-and-out and brought on their punt unit. 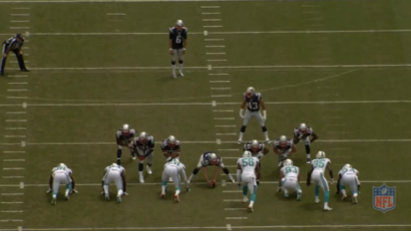 From their own 26-yard-line, New England aligned in a standard punt protection formation. The long snapper was flanked on either side by three “linemen.” Though set up on or near the line of scrimmage, these linemen are typically linebackers and tight ends (rather than offensive guards and tackles). They are also commonly referred to as “big skill” players due to their coverage abilities in defending against the return, which many traditional linemen lack. Situated five yards behind them is a lone player, referred to as the personal protector or “upback”. His responsibilities include calling out the snap count, the play, and any changes that may occur if a fake is called for. He must also pick up any pressure coming through the middle from oncoming defensive players. Behind the personal protector, typically with his heels placed 14 or 15 yards behind the line of scrimmage, is the punter, who may be set up slightly to one side of center. This offset positioning is used if the punting team is attempting to kick directionally from a midfield ball spot towards a sideline, or back to the middle of the field from a spot at one of the hash marks. This formation is shown below. Not shown in this picture are the two gunners, who are flanking wide towards either sideline, and whose primary responsibilities are coverage on the punt return. On the defensive side of the ball, Miami is set up in a typical punt return formation. They have seven men at or near the line of scrimmage whose positioning will vary from play to play based on what they are trying to accomplish. 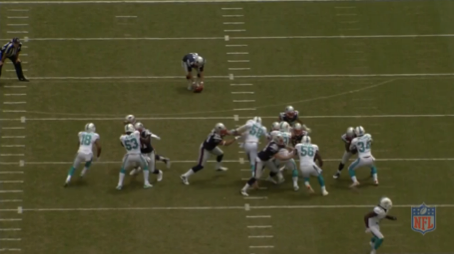 With this basic look, Miami does not appear to be bringing any significant pressure to block the kick, and the Patriots were presumably expecting them to focus on setting up for the return. Before going any further, let’s examine the proper blocking technique by a punting team’s “offensive line”. The method typically taught, and which nearly every player demonstrates during this play, is called a “kick-slide.” The lineman backpedals by sliding his front foot back first, followed by his back foot. It enables a player to keep his feet under him and remain agile, while allowing him to keep a defensive player in front of him for as long as possible. Failure in executing this basic technique by one member of the punt team is a major reason why the punt was blocked. The still image above shows the situation right after the snap. 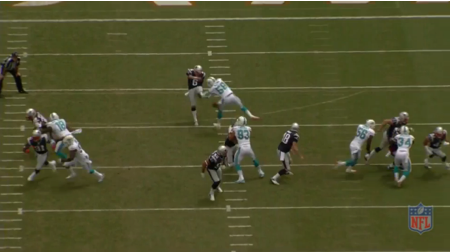 Miami’s Walt Aikens (#35, at lower right) immediately starts dropping off into coverage. This leaves six Dolphins rushing the punter. The Patriots have eight men available to block, including the personal protector, so the numbers are there for them to effectively take on all rushers. On the right side of the line Jonathan Freeny (#56) and Jason Trusnik (#93) are beginning to twist (with Freeny moving to his right behind Trusnik) in order to generate a rush from that side. Most punt teams employ a zone blocking system, in which each blocker meets the rusher in front of him. When faced with a twist move by a pair of rushers, the two blockers typically switch assignments with each taking on a new man. Right after the twist is where the breakdown begins. The maneuver is picked up effectively by the right side of the line. However, New England’s Rob Ninkovich (#50, center of photo) uses poor technique. He fails to kick-slide effectively, instead trying to aggressively punch with his arms as Miami’s Chris McCain (#58) advances up the middle, as opposed to dropping back and letting the rusher come to him. McCain absorbs the contact, which essentially pushes him laterally to his right and gives him an unimpeded path to the punter. Compounding the problem is the decision made by personal protector Nate Ebner (#43, at upper right), who continues to sit on the overloaded side of the line – even after Aikens drops back into coverage – instead of picking up the free man to his right (McCain). This is a critical mistake by Ebner. On top of the blocking miscues, notice that punter Ryan Allen (#6) has bobbled the low snap from long snapper Danny Aiken (#48). Typically snap-to-kick times in the NFL range from 1.7 to 2.0 seconds in ideal conditions. In this case, the snap-to-kick time was approximately 2.3 seconds. You might ask, “How much difference can a quarter of a second make?” The average NFL linebacker typically covers approximately one yard per tenth of a second once they are at full speed. This means McCain was able to advance two to four extra yards with the delay in getting the kick off. But did the low snap and the time it cost make a difference? The answer is yes, without a doubt. The muffed snap was a major factor in this failed play. McCain is approximately even with Allen when he blocks the punt. A typical NFL punter will release the ball anywhere between 9 and 11 yards behind the line of scrimmage. Allen is about 10.5 yards back of the line when he kicks the ball. With a clean snap and catch, the ball should be in the air with one or two yards to spare. So what happened on this play? Everything that could go wrong went wrong. First came the poor block by Ninkovich, followed by poor decision-making by Ebner, combined with a low snap and dropped ball by the battery. It was a collective failure, as avoiding any one of these mistakes would have likely resulted in a successful kick by New England. This is one of the main reasons Patriots head coach Bill Belichick repeatedly stresses to his players to “do your job.” If only one thing goes wrong on a punt attempt a team can usually still get the kick away without any major issues. But when there are multiple breakdowns and failures at several levels, the play unravels quickly and disaster results. There were also 3 more punts blocked in week 2, which now brings us up to 6 blocks total so far for the year. If this keeps up, it is going to be triple the number that we saw in 2013, and we are also seeing approximately 10% less punts per game right now than in 2013, which means that the punt block rate so far has gone from 0.5% last year to 2.2% this year. I’m going to have to go through more tape to see if there is anything notable happening in these other cases, but it may just be early season “sorting out” on special teams. Any idea how many of the blocked punts last year came early in the year as teams sorted out their special teams issues? I’d be curious to see if block rates go down as the season progresses. It looks like there were 3 punts blocked in the first two weeks in 2013, 6 in 2012’s first two weeks, just 1 in 2011. Last year we had two in week 1, and one more in week 2. Week 1 is always a bit of a mess, because you have units with a lot of annual turnover that are trying to figure out what to do. The fact that we had three more in week 2 this year is very interesting to me, and something I’ll have to watch on the tape to see exactly what was happening. Did anyone get a chance to see any of the other games this weekend that had blocks in them? I take the 2012 data with a bit of a grain of salt since the change was made after the season to prevent players from lining up over the long snapper. This affects a team’s ability to generate pressure through the A-gaps, as you can’t turn and manipulate the long snapper as easily from where you have to line up now. I really enjoyed (umm, well not “enjoy”) reading the article Chuck, and would love to see a follow-up on Jones’ punt block. 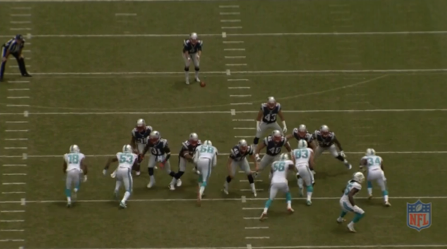 Looked like it was more of an athletic play on his part rather an a series of screw-ups (Nink + Ebner) for the Pats. I wonder how long Aiken will be on the team when his mistakes are thinning the margin for error. This is a major question as well, and something that was unexpected heading into the year. Coaches typically have very little tolerance for mistakes by long snappers, and if this continues to be a problem, you will absolutely see Aiken gone before the end of this year. Belichick seemed kinda down on Aiken even before this year’s yips – he had Charley Hughlett in during camp last year, and Tyler Ott in camp this year, then the whole releasing-Aiken-and-re-signing-him saga. BB seems to want to upgrade the spot but hasn’t found anyone better.